On a blustery morning on 24th November in Menai Bridge, a flotilla of moustaches appeared from the Menai Strait to support Movember (the month formerly known as November). Movember is a charity that aims to raise awareness and funds for men's health issues including prostate cancer and testicular cancer. On the first of November participants start clean shaven and document their moustache-progress with friends and family raising money as they go. 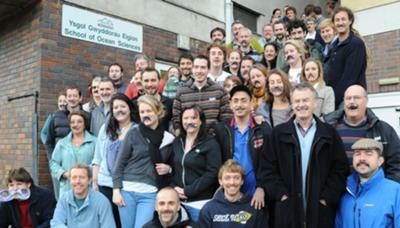 The Menai Mobros includes participants from the local marine and environmental sector including the School of Ocean Sciences, Countryside Council for Wales, Marine Ecological Solutions and Hebog Environmental. Those unable to grow "Mos" (mainly the ladies) instead donned paper tashes to support the cause and help raise money and awareness for the charity. So far £2400 has been raised but the end of Movember (and hence the removal of moustaches) is still days away and donations do not close until 10.00pm on the 8th of December. If you would like to support the Menai Mobros, donations may be made via the Movember website by searching for the "Menai Mobros" or following the link: http://mobro.co/menaimobros. Alternatively, donation boxes are present in the Post Office, the Auckland pub and Hardware store (Evans) (all in menai) or you can send a cheque made payable (along with a supporting message which will be uploaded onto the website) to Andrew Johnson, to: School of Ocean Sciences, Askew Street, Menai Bridge, Ynys Mon.